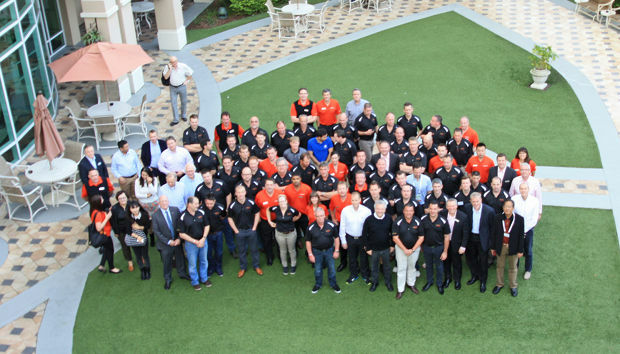 A party of 70 Ransomes Jacobsen guests and staff from Europe, augmented by a further 20 from the Asia-Pacific territory attended the Golf Industry Show in Orlando recently. The activities on the hectic six-day round trip included a day’s golf at Grand Cypress Golf Club, Jacobsen’s Super Bowl party, a visit to Jacobsen’s manufacturing facilities in Charlotte, North Carolina, a tour of the maintenance facilities at Arnold Palmer’s Bay Hill Golf & Country Club, a visit to the combined Smithco/Turfco demonstration morning at Reunion Resort, an evening at Jacobsen’s hospitality event held in Disney’s Epcot World Showcase and two days at the show in the Orange County Convention Centre. The Jacobsen stand at show featured the new AR722 wide area contour rotary mower, a refreshed Jacobsen Turfcat out-front rotary, a new bi-directional turf groomer and brush system for selected Jacobsen greens mowers, the latest development of the lithium-battery powered Eclipse 322 and a cut-away Kubota Tier 4 compliant common rail diesel engine showing the system used for lowering particulate emissions. “I didn’t really know what to expect as this was my first time as a guest of Ransomes Jacobsen to the Golf Industry Show. However, it was a great experience; we were looked after so well from start to finish and the hospitality was out of this world. The Jacobsen stand was very impressive and the overall show is huge, with so much to see.